Methanesulfonic acid (MSA) in polar ice is an important indicator when studying climate variability across different geological eras. However, MSA can migrate up and down within the polar ice, confounding both measurements and interpretations of measurements. This phenomenon is well known but poorly understood, which potentially reduces the value of the measurements. 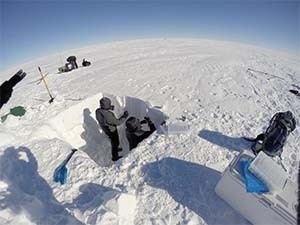 Professor of Chemistry Matt Evans and his co-authors used MSA records from 22 ice cores from Greenland and Antarctica. Their research shed new light on the MSA migration process and produced a simplified model to aid interpretation. Their model resulted in good news and bad news for scientists using MSA to study climate change. MSA migration can scuttle measurements at the scale of geological eras. However, variation in ice core MSA concentrations is a useful chemical indicator of climate variability that occurs on decadal time scales.